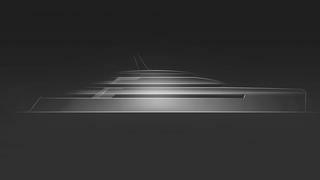 The largest Vitruvius Yachts project yet, a new 80 metre known as VY80, will be built by Turquoise Yachts in Turkey. As the largest yacht in the Vitruvius lineup, the build of VY80 marks a milestone for Vitruvius Yachts, the brand designed by London-based Philippe Briand that’s focused on creating “efficient, robust and long-range” superyachts. VY80 is also significant for her Turkish builder, as it’s one of the first new builds since Turquoise rebranded itself from Proteksan-Turquoise with a new lifestyle strategy. It is also one of the first new builds since Dr. Mohammed Al Barwani acquired a majority stake in the company. VY80 will carry forward Vitruvius Yachts’ familial styling cues, but the streamlined yacht will also stand out with a superstructure designed to give a sense of transparency. This affect will be achieved with copious use of glass. Project VY80 is designed with generous living spaces and will boast an owner’s deck, set just below the sun deck, comprising a stateroom, office, owner’s saloon, and private owner’s terrace with Jacuzzi forward. VY80 will accommodate 12 guests in total and 21 crew. The teaser rendering doesn’t show the luxury amenities that the VY80 will have, but it’s reported that floor-to-ceiling windows amidships will give stunning views out onto the water from the connected gym, spa, sauna, hammam and plunge pool. A beach club will provide the launch space for watersports. More than 395 square metres of deck space will sprawl over four decks, with outdoor living enjoyed in an infinity pool, lounge spaces, al fresco dining and two Jacuzzis. Notably, this is the first Vitruvius yacht to be built at a yard other than Picchiotti/Perini Navi, where the first three award-winning Vitruvius yachts were launched. Starting with 50 metre Exuma in 2011, followed by 55 metre Galileo G in 2012 and 73 metre Grace E last year – which was the winner of Motor Yacht of the Year in the World Superyacht Awards 2015 – the Vitruvius range has grown with each launch. "[VY80] is the first of three new builds with three different shipyards," Veerle Battiau, general manager of Vitruvius Yachts, tells Boat International, hinting that there will be more Vitruvius news to come of new builds at other yards. There are currently platforms for 45 to 100 metre Vitruvius yachts to be built, but the 80 metre VY80 is the largest Vitruvius to be built to date and is scheduled for launch in 2018. Could the new P100 concept become the fastest ever WallyCento?